At the Law Offices of Roshni T. Desai in Santa Ana, California, you can find the quality services you need for your legal issues under one roof. 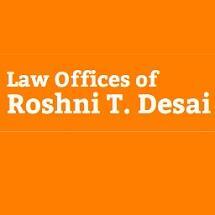 Attorney Roshni T. Desai possesses over 18 years of experience, serving a diverse range of clients throughout our region since 1998. Our law firm provides exceptional counsel, advocacy and support to clients throughout Orange, Riverside and San Bernardino counties and the surrounding areas. Throughout the history of our firm, we have earned a reputation for personalized representation and helping our clients achieve their specific goals efficiently and cost-effectively. Roshni T. Desai can best help preserve what you have worked so hard to achieve and create a lasting legacy for your loved ones. For more information on the Law Offices of Roshni T. Desai, call our law office or visit our website to schedule a free initial consultation.